Gosh, many of my family's traditions sound very similar to yours, Michael, including the new Christmas pajamas, one that my daughters and I started in the years we were "3 girls against the world"! We also woke up early, opened one present Christmas Eve, and listened to the same Christmas albums every year. I was interested to read of the old ones you were able to locate. I've been trying to find a children's Christmas album (compilation) that I had has a child and my parents threw out at some point. I've never been able to find it, but I'll keep looking! Anyway... on to one of our most treasured traditions... the reading of the Christmas stories. In my own childhood, my mother always read of Jesus' birth from the Bible on Christmas Eve before we went off to dream of Santa's visit. I wanted to incorporate that into my children's lives as well. Somehow over the years, the reading of the Christmas story expanded into reading 3 different stories. I had two daughters and was a single mother for more than 10 years. During those years, my girls learned to read, so on Christmas Eve, we each read a different Christmas story. My oldest daughter read "The Night Before Christmas" poem by Clement Clarke Moore. My younger daughter loved the Nutcracker story, so she read from a small story book that summarized it. 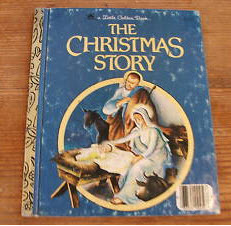 And then I would read the story of Jesus from a small Golden book that we bought when they were very young. We all loved this tradition so much that even when my girls grew up and moved away, we read them to each other over the phone or over a web cam for a couple of years! We're no longer doing it and it's one of the traditions I miss most from their growing up years. Thank you Kathi. That is a beautiful story that you told. Even reading it over the phone. Wow, that is great. Maybe this should be the year to revisit this Christmas tradition.